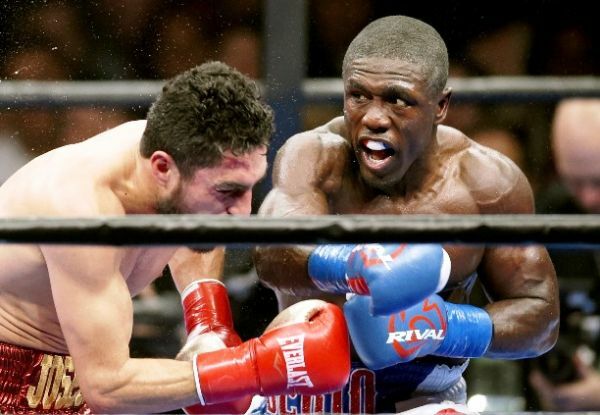 Former welterweight titlist Andre Berto overcame a slow start to score an emphatic sixth-round TKO over Josesito Lopez on Friday night in Ontario, California. A chorus of boos from the crowd did nothing to stop former welterweight titlist Andre Berto from celebrating his comeback win. Trailing on the scorecards midway through his 12-round bout with Josesito Lopez at the Citizens Business Bank Arena in Ontario, California, Berto scored a pair of knockdowns en route to a sixth-round TKO win in the debut of Al Haymon's "Premier Boxing Champions" series on Spike TV. But the victory wasn't without at least a small amount of controversy. After a straight right hand from Berto floored Lopez for the second time in Round 6, Raul Caiz Jr. instantly waved off the fight at 1:30 without giving Lopez, from nearby Riverside, a chance to reach his feet. "I know I was in his backyard and I wanted to bring heat to him," Berto said. "Everybody knows Josesito is a competitor. I knew he could hurt me so I just wanted to try and break him down a little bit." Berto (30-3, 23 KOs), 31, recorded his first high-profile win since losing three of four fights between 2011 and 2013. But he was forced to overcome an aggressive effort by Lopez (33-7, 19 KOs), who won the early rounds by consistently working the body. Lopez began to show swelling under his right eye in Round 4 as Berto closed the gap while the two fighters traded hard hooks in the corner. "I have a pretty good jab and they say it's pretty quick. So I tried to use my jab to set up the right hand," Berto said. "I think I proved tonight that I am back in the mix." Shawn Porter bounced back in a big way during his first fight since losing his welterweight title by knocking out late-replacement Erick Bone in Round 5. After Porter's original opponent, brawler Roberto Garcia, was a no-show at Friday's weigh-in due amid a report of being at least four pounds over the limit, Bone, 26, of Ecuador, flew in from New York on 24 hours' notice. "I watched a little bit of him on tape last night and he was tough with quick hands and liked to throw power shots," Porter said. "I knew it was going to be a good fight and I didn't know how long it would take. But we got him with some good body shots." Porter (25-1-1, 16 KOs) was the aggressor from the outset, yet found himself in a competitive fight against Bone (16-2, 8 KOs), who landed clean counter shots throughout. The action heated up in Round 5 when Bone caught Porter off-balance with a pair of counter right hands that caused him to stumble. Porter, 27, responded with huge body shots before appearing to floor him with a right hand that left Bone wincing. Referee Jack Reiss ruled it a slip, but Bone appeared to hurt his right leg. Porter rushed in to score a knockdown on a body shot and came back with a vicious combination floor Bone a second time. Reiss reached the count of 10 at 2:30 as Bone was attempted to remove himself from being pinned under the ropes. "I knew he was hurt and it's something we have worked on throughout our career -- going to the body to wear him down," Porter said. "We focused on that in the gym and it showed up tonight. "I feel great, I feel blessed. God is blessing Team Porter. I know what level I'm on. No need to take any steps back just because I lost. It's Friday the 13th and Team Porter is 1-0." Two-time heavyweight title contender Chris Arreola was pushed to the limit and forced to gut out an eight-round unanimous decision against unknown Curtis Harper. Harper (12-4, 8 KOs), who overcame a knockdown in Round 1 and was lucky to make the final bell, fought with tremendous heart to create a sloppy, yet thoroughly entertaining war. Although the fight appeared up for grabs entering the final round, Arreola was victorious on judges' scores of 76-75, 78-73 and 77-74. Arreola (36-4, 31 KOs), who appeared to hurt his right hand in Round 3, entered the ring 21 pounds heavier than his last fight, when he was stopped by Bermane Stiverne in a May 2014 vacant heavyweight title bout. Harper appeared to have Arreola hurt in Round 3 and went on to batter him with a series of uppercuts in the following round. Both fighters overcame poor conditioning to brawl on even terms over the final four rounds.